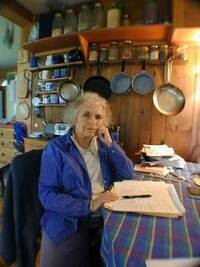 The day before Grace Paley died, she may have heard me leave a phone message on her machine. Now, I can’t help but wonder: When would she have returned my call? What would we have talked about? Almost three months before, I had met the writer and then-state poet of Vermont and requested to interview her for a future edition of Seven Days. While it’s sad to think what might have been, my missed interview is a mere footnote in a much larger narrative. That’s because Paley, who passed away on August 22 in her Thetford home at the age of 84, has already given me a lifetime’s worth of characters and ideas to contemplate. Hence, this story describes not so much the writer herself as the way in which her prose has graced one reporter’s heart. How does one summarize Paley’s life without boxing her in? Yes, she once studied with the famous poet W. H. Auden. Her Collected Stories (1994) was almost awarded both the Pulitzer Prize and the National Book Award. She befriended writers such as Tillie Olsen and Donald Barthelme. She taught at Columbia University, the City College of New York and Sarah Lawrence College. She won a Guggenheim fellowship. But that’s only part of her story. Paley was first and foremost a lover, mother, neighbor and citizen. Her poems and stories were essential ingredients in her life, but they didn’t overwhelm it. A native of New York City’s Greenwich Village who later relocated to Vermont, she typed some of her first stories in a PTA office. She handed out political leaflets on her street corner. She visited Vietnam and Nicaragua in opposition to American militarism. In 1979, she was arrested for speaking out against nuclear weapons and nuclear power on the White House lawn — one of several run-ins with the law. I first came across Paley’s work at a moment of internal fission in my own work — about two years ago, in a fiction-writing workshop at Middlebury College. I had just completed my first two stories, both of them long-winded and silly. One concerned a suburban mom who’d baked her soul into a pie; the other, a fake historical account, profiled the 18th-century inventor of the picnic table. Don’t ask. I guess it seemed to me that literature, like religion or drugs, was more effective the further it transported a reader away from earthly realities. Then my professor, the novelist and short-story writer Robert Cohen, assigned “Wants,” Paley’s elliptical ditty about a woman’s chance encounter with her ex-husband. At two pages, the story seemed insignificant: Its protagonist meets her ex on the steps of a public library, they talk, and she returns her books. I brushed Paley’s piece aside — short stories were short, OK, but how could you say anything literary in fewer than 1000 words? On a mild evening in June 2007, I saw Paley read at the Lowe Lecture Hall in downtown Johnson. She’d been invited to commemorate construction of a new writing studio at the nearby Vermont Studio Center (VSC), a 23-year-old creative community offering residencies for artists and writers. Paley, who’d given a reading in New York the night before, looked frailer than I’d expected she would. She had to crane her neck to reach the microphone. That night, Paley read a smattering of old and new works. One of them, “Debts,” follows “Wants” in her 1974 book Enormous Changes at the Last Minute. Considering that Paley would die just a few months later, her decision to read that particular story seems prophetic. “Debts” tells the story of a woman who gets a telephone call from another woman asking her to write about the latter’s grandfather. Though it’s about as brief as “Wants,” I consider it one of Paley’s most hauntingly elegiac works. In “Debts,” Paley’s narrator refuses the woman’s request, but decides to tell a different story about a friend’s grandmother. “I owed nothing to the lady who’d called,” the narrator explains. “It was possible that I did owe something to my own family and the families of my friends. That is, to tell their stories as simply as possible, in order, you might say, to save a few lives.” Was Paley’s reading of “Debts” at VSC an attempt, conscious or not, to memorialize her own life? Judging by the receiving line that formed after her reading, I think the audience was glad, too. From the back of the queue, I noted that all the people in front of me were at least 20 years my senior. Maybe that’s why, when Paley saw me approach, her face lit up. “Thanks for sticking up for my generation, Grace,” I said. “Oh, I love your generation!” she gushed, kissing me. In the two years since I first came across Paley’s writing, I have processed words in novels, articles, emails, poems, press releases, collection notices and recipes. But perhaps the most resonant ones lie in her shortest short stories. Paley’s work presents me, as a writer, with an ongoing challenge: How does one compress life into art without stripping it of meaning? Consider, for example, one sentence from “Wants”: Just this morning I looked out the window to watch the street for a while and saw that the little sycamores the city had dreamily planted a couple of years before the kids were born had come that day to the prime of their lives. For me, that sentence is one of the most telling in the Paley catalogue. First of all, it explores a sense of time that’s both casual and poignant. Just this morning, the narrator offhandedly suggests, I discovered something profound. The sentence also speaks to Paley’s environmental dexterity — she painted Vermont’s landscape as easily as Manhattan’s — and omnipresent sense of civic engagement. Most importantly, it implies a sweet reverence for generational cycles: The narrator marks time by the ages of her children. Paley’s 1992 interview offers some typically understated guidance. Asked why people might consider her writing “wise,” she responded, “That’s because I’m old. If I have any nascent wisdom in my head, Grace, it’s this: You were always much wiser and less foolish than you let on.